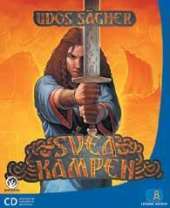 The year is 890 AD and a young Swede known as Udo is making himself ready to go to the island of Birkö to take part in an old custom known as Sveakampen, where the bravest and most skilled Northern fighters compete under peaceful forms. This turns out to be easier said than done and a number of tasks has to performed before Udo can reach his destination. Udo got a ship but it's not in the best condition and is in need of some massive repairs before it can set sail. Once at Birkö, Udo and his crew gets to compete in the games but it is not long before Udo gets involved in far more serious matters. The king is being attacked by his brother who wants to take control of the crown and the only one to help him against the usurper is of course Udo. This is an adventure game based on the book Sveakampen by Martin Eriksson (more known as E-Type). Due to it being targeted towards a younger audience, the gameplay is less complex than many traditional games of the genre, but solving puzzles and interacting with the many characters of the game is still at its core. The game world is in full 3D and the player takes control of Udo from a third person perspective. Basically there is three different commands that can be used on characters or objects: talk, give and pick up. Objects that are picked up are stored in Udo's inventory and can be used to interact with other objects. In his inventory, Udo has a diary that stores important information about what needs to be done to complete the task that lies ahead. Udo will meet many different characters in his journey, some are friendly while others are not, and Udo therefore has to talk to them in different ways. Often it's best to be polite but in some cases it's necessary to use stronger words. At times the player gets to play as other characters that Udo meets in his travels. The game also has some sword fights which are simple turn based affairs. The player chooses between three strikes (high, low or middle) and depending on how the enemy is positioning his shield he will either hit or miss. After a strike the enemy does the same thing and the player instead has to choose a position of his shield.